Once registered with a valid serial number, SignalScope will indeed create an ascii text file containing data from the current measurement. The text file can then be opened in another program, such as a spreadsheet or numerical analysis application, for further processing or plotting. SignalScope (and Pro) currently support audio input devices only. Offering compatibility with non-audio instrumentation would require Mac OS X compatible drivers, which are generally not developed by the hardware manufacturers. National Instruments does offer Mac compatible drivers for some of their hardware products that might make it fairly straightforward to offer input from NI data acquisition hardware within SignalScope. This has been considered, but unless there is a great deal of interest, it may never materialize. Do you need bandwidth above 96 kHz? What voltage levels do you need to analyze? I'm not clear about what you mean. In case this is what you're asking, SignalScope Pro does not route its inputs back to the audio output device. However, you might want to take a look at Sending signals directly to SignalScope with Jack OS X in the Articles forum. Jack will give you various options for routing audio signals within your system. If this doesn't answer your question, please offer some clarification of what you're trying to do. Yes, you will be able to activate the products in both locations. As long as you have Digidesign's Core Audio driver installed, the Digi 001 should work. SignalScope has been tested with the Digi 002 and that works fine. Wouldn't it be great if you could use SignalScope for frequency response measurements? Well, you can! 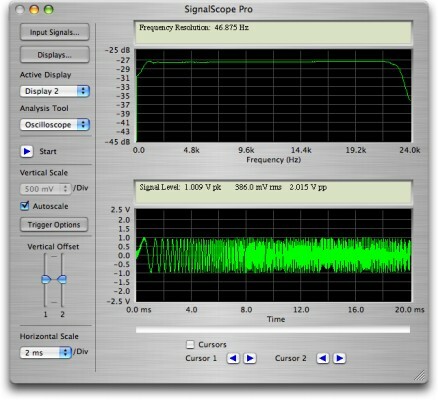 There are numerous ways to perform frequency response measurements, and future versions of SignalScope Pro will offer more of them, but SignalScope and SignalScope Pro offer some options for performing basic measurements right now. The tools used in the demonstrations below include SignalScope (and SignalScope Pro), SignalSuite, and audio input and output (I/O) from an Edirol FA-101 FireWire interface. Frequency response measurements are often performed using narrowband or fractional octave band spectral analysis. 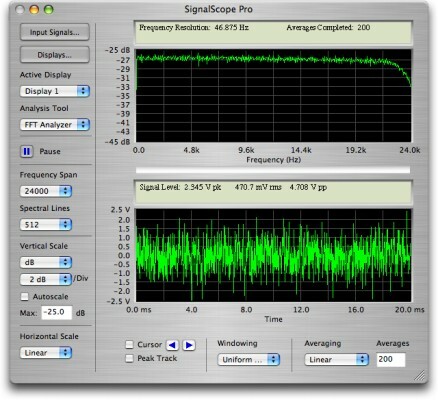 SignalScope can perform narrowband analysis, but SignalScope Pro is required for octave or third-octave analysis. The basic idea behind the measurements described here is that if a spectrally white signal is applied to the input of a device (hereafter referred to as the device under test, or DUT), the spectrum of the DUT's output signal will represent the frequency response of the DUT. A signal with a white spectrum is one which contains equal energy at all frequencies, so that if viewed on an FFT analyzer the spectrum will appear as a flat, horizontal line. Additional explanation follows. 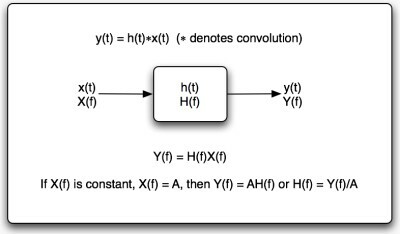 Consider the block diagram, below, in which a linear, time-invariant (LTI) system, represented by h, has an input signal, x, and an output signal y. In the time domain, the system's output, y(t), is the convolution of the input signal, x(t), with the impulse response of the system, h(t). In the frequency domain, the system's output, Y(f), is the product of the input signal, X(f), and the frequency response of the system, H(f). Now, if the input signal is spectrally white, it will be a constant value for all values of (f). Let this constant be A and the frequency response of the system is given by the output signal divided by A. This means that just by measuring the output signal of some unknown system, the DUT, its frequency response can be measured, as long as the input signal is spectrally white. SignalSuite provides several types of signals that can be considered spectrally white under certain conditions. These include random noise, Maximum Length Sequences (MLS), specially tailored pseudorandom noise, and chirp (swept sine) signals. The use of each of these is demonstrated below. The question often arises of whether one can use SignalScope (or SignalScope Pro) to analyze signals directly from another application (like SignalSuite or iTunes). Although this can be done via an appropriate cable routed from the audio output on your Mac directly to the audio input, there is another solution which allows the routing to be done entirely in software. Jack is a type of audio server, which allows audio data to be transferred directly between applications on your Mac. Although Jack was originally written for the GNU/Linux operating system, Jack OS X provides a convenient implementation for Mac OS X. Please visit the Jack OS X website, www.jackosx.com, to learn more about Jack OS X.
Download and install Jack OS X (version 0.71 was used for this tutorial). After installation, run the JackPilot application. Click the Start button to start the Jack audio server. Run SignalScope and SignalSuite (both applications must be started after the Jack server is started). In the audio output device setup section in SignalSuite, select Jack Router as the current device. In the audio output device setup section in SignalSuite, select Stream 2 for Channel 2 (Right). In the audio input device setup section in SignalScope, select Jack Router as the current device. In the audio input device setup section in SignalScope, select Stream 2 for Channel 2 (Right). In JackPilot, click the Routing button to open the Connections Manager. Under Send Ports, click on SignalSuite (once) to reveal it's output destinations (colored red) in the Receive Ports list. Under Receive Ports, double-click SignalScope (or SignalScope Pro) to designate it as a receiver of SignalSuite's output. If Built-in Audio is also colored red, double-click it to remove it from SignalSuite's output destinations. Under Receive Ports, click on SignalScope (once) to reveal its input sources (colored red) in the Send Ports list. If Built-in Audio is colored red, double-click it to remove it from SignalScope's input sources. Make sure SignalSuite is colored red in the Send Ports list. Feel free to use this forum to post questions, concerns, suggestions, tips, or other relevant information regarding SignalSuite. Feel free to use this forum to post questions, concerns, suggestions, tips, or other relevant information regarding SignalScope. Feel free to use this forum to post questions, concerns, suggestions, tips, or other relevant information regarding SignalScope Pro for Mac.